"A good snapshot stops the moment from running away." Guilt and motherhood seem to go hand in hand. When I became a mother, there were many things sure to bring on a case of "mommy guilt": allowing my toddler to watch Elmo for an hour straight, checking email instead of catching up on laundry duty, reading the entire Twilight series in three days while the house fell to pieces around me, or plying the preschooler with Cheez-Its during a shopping trip. But after chatting with many of my friends (singles, young marrieds, moms of all ages), I've learned that one of the biggest worries sure to induce a guilt trip (whether you're a mom or not!) is that ever-growing pile of photographs in the plastic bin under your couch, or the files waiting to be downloaded from your Nikon. Do you have a secret box of photos stashed away that you'd love to display...or even just organize, but you don't know where to start? Guess what? You don't have to be a scrapbooker to find fun and creative ways to organize and preserve your family's most precious moments. I repeat, you don't have to lock yourself up in a craft closet with a pile of stickers and 14 pairs of decorative scissors in order to document your life. The weather is likely still cold where you are, so take advantage of this last month or two of "hibernation" and get yourself back on track! Are your photos still waiting patiently on your camera's memory cards? Those memories aren't doing anyone any good sitting around as jpegs. Or maybe you planned to just pass your camera around like a photo album at the next family reunion? The best place to start is to set aside some free time (what's that?!) to get those digital photos downloaded and organized on your computer. Treat yourself to a Starbucks first if you really need the motivation. Many bloggers like to use sites like Kodak, Picasa, Shutterfly, or Snapfish to back-up, edit, and order prints of their photos. I personally keep my family pictures organized by month/year in folders on my computer. I use Kodak Picture CDs or Photo DVDs from Costco as back-ups. But remember, hard drives crash and photo CDs could be obsolete (or unreadable!) in 20 years. This is why printing your photos should be an important goal. Maybe your photos are already printed, but they've been stuffed inside a photo storage box. Going through and organizing by year (and month, if you are able) is a great way to begin. I personally like to have my pictures out where I can see them, so I buy albums that let you slide your photo into a plastic sleeve and write a caption next to it. Target carries cute albums, but I've recently found some large, plain ledger-style books at JoAnn Fabric that hold more photos and are expandable. Be sure to look for acid-free paper. When I'm feeling nostalgic, I can pull an album off the shelf and thumb through without wondering "Who is in this picture, what are they doing, and where are they?" My girls can also flip through without getting grimey cracker-crumb finger prints everywhere. No extra papers, stickers, or embellishments were needed. This is the easiest way to organize your photos in a way that gives your family and friends easy access when they visit. This is where you can have some fun! If the thought of paper, glue, and scissors doesn't appeal to you, consider going digital with photobooks. Most of the big online photo sites send out great deals periodically. My guests love to thumb through my Shutterfly photo books I keep on the coffee table. I usually manage to score a free 8x8 each summer because I keep track of Shutterfly's emails. The blogging world is your oyster if you need some inspiration for displaying your very favorite snapshots. Houzz had a fabulous article filled with ideas for creating unique photo walls. Set goals for yourself and remember that Rome wasn't built in a day. I'd love to be able to make some beautiful scrapbooks for my girls, but fitting in time-consuming creative projects just isn't in the cards for me these days. I stay caught up by printing photos and doing my best to get them into those slide-in albums. I bet you're wondering why I'm so motivated to stay on top of family photos. Please feel free to visit my mom's house with me someday. Her kryptonite seems to be photo organization. 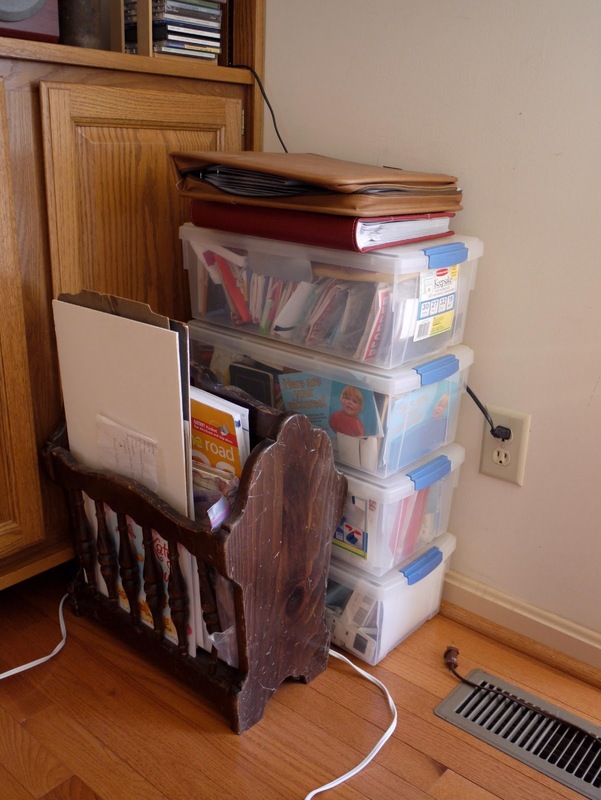 The Leaning Tower of Tupperware contains years worth of family photos, and there's a cardboard box in the basement stuffed full of more pictures from the pre-kids days. It will one day become my unhappy task to catalog those. The mere thought of it drives me to the photo kiosk to print my own stuff. I wouldn't wish those tupperware bins on any of you. 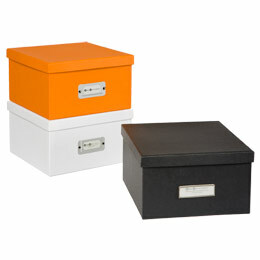 So get busy, get creative, and use those bins for carting your yard sale wares outside come Spring! Ugh! Now you have called me out about the plastic bins filled with photographs!!! Sniff!! Guess I better roll up my sleeves and start to deal with them. Darn!! I was going to leave them for the next generation. LOL!! My hubby recently let me organize his office space and I found boxes of our old photos. I can't bring myself to throw any of them out even though some of them are just weird and random. I think it's time to at least get them organized! We used to use those slide-in photo albums, then switched to scrapbooking. And that's when I started to fall behind! I want to scrapbook everything, but I just don't have the time or energy. So yes, our photos are on memory cards, on the computer, on CDs, and in boxes. So funny you write this...I am 3 years behind...that's the entire time I have been married and had Bree...of having all of my pictures printed out. They're lurking on memory cards, and cd's and my computer. I am definitely going to take a day this week to get them printed out. The ones I do have printed out, are in a box in the closet...they need to be in photo albums. Oh, Amanda. I WISH I just had Tupperware bins. In my house, photos are scattered hither, thither, and yon. The last time I put photos into an album, my middle son was two years old. He's now 16. One of these days, perhaps I'll take some inspiration from you and organize at least SOME of these. For now, I'll admire you from afar. Oh, it is so true about the guilt and the motherhood...so, so true. I think you read my mind! I have a photo drawer! I have printed up to Christmas this past year but not since and none of them are in albums agh! Great tips Amanda!!! I just love your blog. Such good information here. I am so glad that I found you! Great tips! I am famous for buying scrapbook albums and doo-dads, then getting only partway done before life takes over LOL!! But at least I try! :) I am starting a photo wall in our stairwell and trying to print out as many photos as I can. I'm also starting a "lifetime" scrapbook for each kid where I'll just put the most special photos of them from birth through high-school graduation -- they can have it when they get their own 1st place. This is such a good post. We haven't printed a single photo in years and years. They are all saved on our computer and backed up on an external hard drive and also by some other gismo. I love looking through photo albums and do miss having printed pictures. You are smart to stay on top of the pictures that you take now by organizing them into albums. My mother has an absolute mess of pictures - drawers full of them all mixed up together. I guess I'll end up doing something with those one of these days. It sounds similar to what your mom has waiting for you. I inherited all of Granny's slides. I started scanning them last winter and got maybe 10% of them done. I should have worked on that during my 12 day break from school. I was an avid scrapbooker for about the 1st 12 months of my oldest's life! Now it is complete chaos as far as my photos go! Thanks for reminding me to back up my pictures! I keep saying I'm going to then forget! Great post and wonderful tips. And might I just add one. It is ok to throw away some pictures! One doesn't need 50 pictures to remember a great trip to the zoo, a couple really good ones will do (and they become much more valuable when they don't drown in the multitude). Just my two cents. Good luck with the giant tubs. I am one of those moms who have 20 years worth of pictures..all over..we have moved several times and pictures are in this box, and that box. I know I need to go through these pictures and pick and choose what to keep. Most of them were taken before digital cameras were around so everything on the roll got printed..ugh. Any suggestions on how to start? Need a plan, girls..
Great tips and yes motherhood and guilt go hand in hand. What I feel guilty about is the number of pictures I have of my first, and the lack of pictures I have of my second. It really is pretty sad. Thanks for visiting. Last time I put photos in an album, my middle daughter was about 3 months old. She is now almost 10. I have my photos organized on my computer but if it crashed, I'd be screwed. I do have some backed up on CD. I never thought in a million years about CDs becoming obsolete but I guess it's entirely possible. I better get busy! PS..I posted my pretty in pink pantry re-do if you'd like to see it!